Phobos-Grunt will fall to Earth in January 2012, according to Vladimir Popovkin, head of the Russian Space Agency, Roskosmos, but no one can determine where the satellite will fall or what the damage might be. The Phobos-Grunt space probe seems to be doing fine, floating in space, maintaining its orientation towards the sun. But here on earth, it has lived up to its name – Phobos is Greek for “fear” – due to its failure to leave the earth’s orbit. “All the systems on the spacecraft are working normally and it is orientated towards the sun. So far, we are trying to find out what needs to be done to rectify the situation,” said Vladimir Popovkin, the general director of the Russian space agency. But inevitably, after a while, the orbit will sag and the spacecraft will be left with two possible scenarios: orbit correction or reentry and subsequent fall. At the moment, the possibility that the probe will be able to find its proper orbit is unlikely since there is no communication with it. And so, the second scenario is almost inevitable. Popovkin has said the probe “will be flying through January,” and independent Canadian expert Ted Molczan concurs. More precise forecasts of the time of the fall are not available and, given such an error margin, where the spacecraft will fall cannot be predicted. “Every hour brings more data, so, by the projected time of the fall, we will know the area with a fair degree of accuracy,” a Russian ballistics expert said on condition of anonymity. It is also hard to predict how the fully fueled main propulsion unit will behave when the craft falls out of orbit. The main fears are connected with the fuel, heptyl. In addition to being a strong poison, rocket fuel can cause genetic mutations. But all the present signs are that the bulk of the hazardous liquid will burn up together with the main metal structures or will scatter in the upper layers of the atmosphere upon reentry. “There are 7.5 tons of fuel; it is in aluminium tanks and we have no doubt that it will blow up upon reentry into the dense layers of the atmosphere. It is unlikely that any at all will reach the Earth,” Popovkin said last week. Near Earth spaceflights have a dismal experience of losing probes with far more dangerous content than heptyl in Phobos. Some highly radioactive materials have been lost. In the 1970s, the Soviet Union started making intensive use of low-orbit satellites for radar reconnaissance, which required considerable power to feed the radars. Small nuclear reactors were installed on board for this purpose. Such probes were the basis of the orbital component of the marine space intelligence and targeting satellite Legenda, which enabled Russian submarines to count on hitting the U.S. aircraft carrier fleet with heavy anti-vessel missiles from a distance of 400-700 km. After it spent its resources, the craft was not dropped back into the atmosphere complete: the reactor module was detached and parked in “burial orbits” in space, where they bob to this day. However, occasionally satellites hurtle into the atmosphere together with the reactor and its contents. The most famous fall took place in January 1978, when a Kosmos-954 satellite disintegrated over northern Canada, sprinkling radioactive debris over a fairly long strip of sparsely populated territory to the northeast of Great Slave Lake. After a prolonged fight, the Soviet government paid the Canadians several million dollars in compensation for environmental damage. In another case, the Americans jettisoned a radioisotope source of plutonium along with a lunar module before the crash landing of Apollo 13. They did not bother to search for it, letting it sink somewhere in the Pacific. There have also been numerous cases of emergency scuttling of satellites with potentially “dirty” contents. 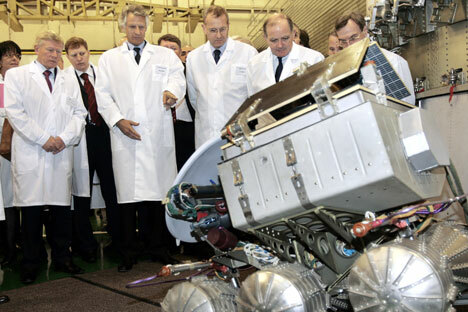 Mars-96, which met with an accident before Phobos, had plutonium isotope generators. Strictly speaking, therefore, the people of earth have dropped all sorts of manmade objects on their heads. Against this background, the fall of Phobos-Grunt is an unpleasant but not a catastrophic event. Konstantin Bogdanov writes on military issues for RIA Novosti.